A new Sam & Max 2010 page is up at Telltale. 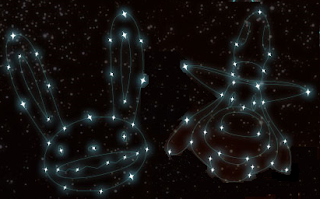 You can click on the stars in the background for concept art, as well as audio of a narrator. What's interesting about that is that the audio mentions that you won't be pointing and clicking, and that "you are all that stands in the way of the total annihilation of the planet Earth". The concept art shows space themed graphics, and the audio would definitely seem to point to an adventure in space. As The International House of Mojo points out, Justin Chin's no-longer functioning business, Infinite Machine, once held the rights to Sam & Max and were making an action adventure game called Sam & Max Plunge Through Space. Is it possible that Telltale is resurrecting this game? Justin Chin joined Telltale in 2008, but he has since left. It's certainly possible that he was working with Telltale on Sam & Max Plunge Through Space during his time there. UPDATE: Jake Rodkin confirmed at Mixnmojo's comments section that it's not based on Sam & Max Plunge Through Space.